Dubai, March 10, 2019: Al-Futtaim Honda, the exclusive distributor of Honda cars, bikes, marine engines and power products in the UAE, has announced the launch of the all-new Honda HR-V. The HR-V marks the presence of an entry level SUV from the Honda range and this 5-seater vehicle has been positioned as a fun and sporty SUV which has been designed for life. The HR-V comes in three grades – the DX, LX and top-of-the-range EX and is available across all Al-Futtaim Honda showrooms in the UAE. The all-new HR-V receives exterior styling that expands its appeal to the millennials. The grille is enhanced by a new interpretation of the “flying wing” rendered in dark chrome and extending over the new projector-style headlights. Under the chrome band, the grille opening has been restyled to emphasize a wide look and the fog light housings have been enlarged to help give the HR-V a more aggressive stance. Also, in the front is a sporty front bumper that gives it an elegant yet rugged look, while the rear Taillights with Integrated LED Light Bars give the HR-V a distinctive, sporty look. New to the SUV-B segment is the Panoramic Sunroof, in the EX grade, making the HR-V feel like a large sporty SUV ready for the next adventure. The HR-V is flanked by 16” alloy wheels for the DX grade and 17” alloy wheels for the LX and EX grade. The all-new HR-V boasts of a youthful vibe with unique styling touches. The intuitively designed HR-V cockpit ensures that everything is where you need it. The elegant dashboard includes the very latest technology, it's incredibly easy to understand and use. Beige Fabric (DX and LX Grade) and Beige Leather (EX Grade) gives the interior of the HR-V a premium comfort feel. Designed to adapt to your lifestyle, the HR-V gives you a clever, comfortable and capacious interior. A centrally-mounted fuel tank provides the HR-V with a huge boot and Honda's novel 2nd – Row Magic Seats are further evidence of smart thinking. The 2nd – Row Magic Seats are designed to configure in lots of useful ways to increase its carrying capacity. The HR-V, like the Jazz, also has the feature of the 60:40 split rear seat. These ingenious split seats can dive down to the floor, making a large space truly vast, or tip up to allow for sideways loading of awkward objects like a bicycle. With the new stay-spring mechanism for the hatch, it's now easier than ever to access HR-V's cargo space of 1,456 litres. HR-V also offers up to 100.1 cubic feet of passenger space with abundant rear seat head and legroom, especially considering HR-V's compact outer dimensions. Some of the other features are a 6.8-inch Display Audio with Touchscreen (LX and EX Grades) with USB and HDMI ports that allow you to connect your smartphone and use its features such as playing your favourite music and using the phone book to make calls to your contacts. A Multifunction steering wheel puts the audio and cruise controls at your fingertips making it a driver-friendly interface. The HR-V EX Grade features automatic climate control where you can adjust the temperature of the cabin with the touch of a button. Standard on LX and EX models are Smart Entry and push-button start. The HR-V has spirited engine performance matched with low running costs. It features a responsive 140hp @6500rpm and a torque of 172 N-m @ 4300 rpm on a 1.8L i-VTEC petrol engine which maximizes economy and efficiency, achieving 16.9 km/l, on a tank of fuel. The HR-V is front-wheel drive, driven by a 7-speed fully-automatic CVT (Continuously Variable Transmission). With the CVT transmission, you have the ability to drive the car in a relaxed, automatic mode or you can change gear using the racing car-inspired, steering wheel-mounted paddle shifters (on EX grade only). At full throttle, the CVT features revised shift mapping that, under hard acceleration, more closely resembles the stepped gear changes of a conventional fixed-gear transmission. This “stepped” feel gives the HR-V a more familiar feel during acceleration, while also helping to reduce interior noise levels. Additionally, HR-V's CVT uses a more refined and natural feeling engagement, staying at lower revs more often. The chassis incorporates a centrally mounted fuel tank, which provides perfect weight ratio and concentrates the mass in the centre. This in conjunction with the amplitude reactive dampers gives the HR-V excellent driving dynamics and helping in minimizing body roll. The 2019 HR-V also benefits from a standard list of active and passive safety features. This includes Vehicle Stability Assist™ (VSA®) with traction control, driver and passenger front airbags standard on all grades, side airbags and side curtain airbags on the EX grade only, Electronic Brake Distribution (EBD), Tire Pressure Monitoring System (TPMS), Hill Start Assist (HAS) and Honda's next-generation Advanced Compatibility Engineering™ (ACE™) body structure. EX grade features a multi-angle rearview camera with wide view feature. All grades also feature LED Daytime Running Lights (DRL) and rear corner parking sensors only in the LX and EX grades. 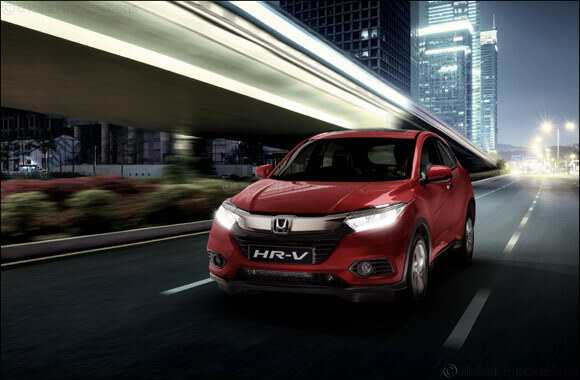 The Honda HR-V starts from AED 69,900.